We ask that groups of 10 or more call 24 hours in advance. Family owned and operated Schmidt Family Vineyards is a destination winery with a beautiful Northwestern Style Tasting Room. With multiple patios, fire pits, sprawling lawns, gardens and plenty of walking paths, you are sure to enjoy your stay. On top of our award winning wine selection we offer pizzas from our wood fired pizza oven, various salads and sandwiches, cheese and fruit platters during the week, and burgers and hand-cut fries on the weekends! We welcome you to join us any season you’d like as we are open year round! Schmidt Family Vineyards is a destination winery offering one of the largest selection of wines in the Applegate Valley. We have a full time chef preparing food off of our menu for our tasting room guests. 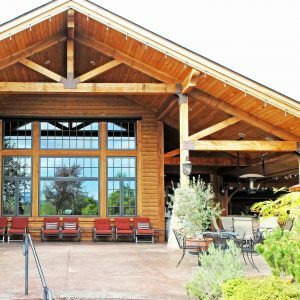 Schmidt Family Vineyards hosts high end events year round . We also have live music every Friday night from 5-8pm.